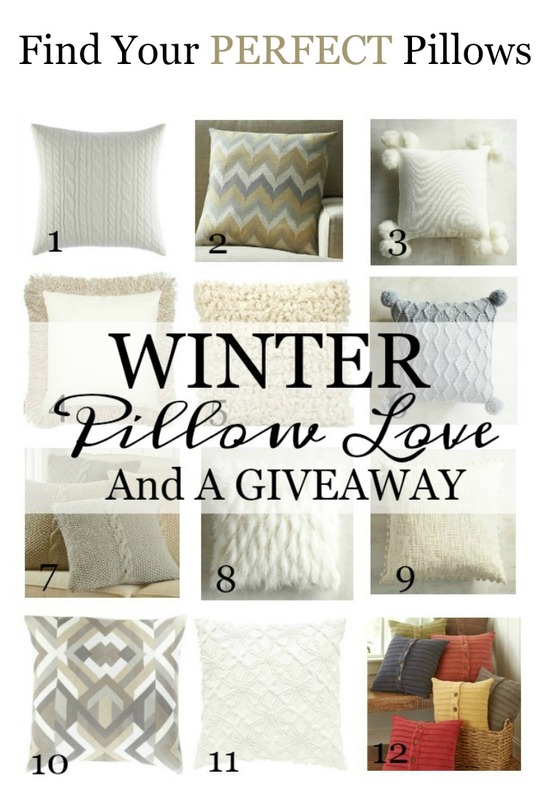 It’s PILLOW LOVE… THE WINTER EDITION!!! Pillow love posts are my favorite to put together! 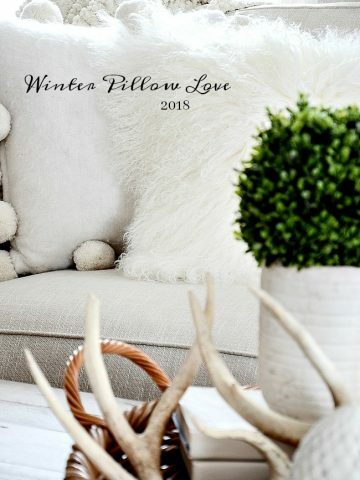 I’ve been scouring the best pillow sites on the web to find a winter collection of gorgeous pillows! Oh, what fun! If you have followed me for even the shortest time you will know that I am addicted to pillows and how they can make a huge decor statement and transform the look and the feel of a room! I think pillows are the best investment. They finish and polish a room sorta like a great pair of shoes or a wonderful handbag finish a fashion look. 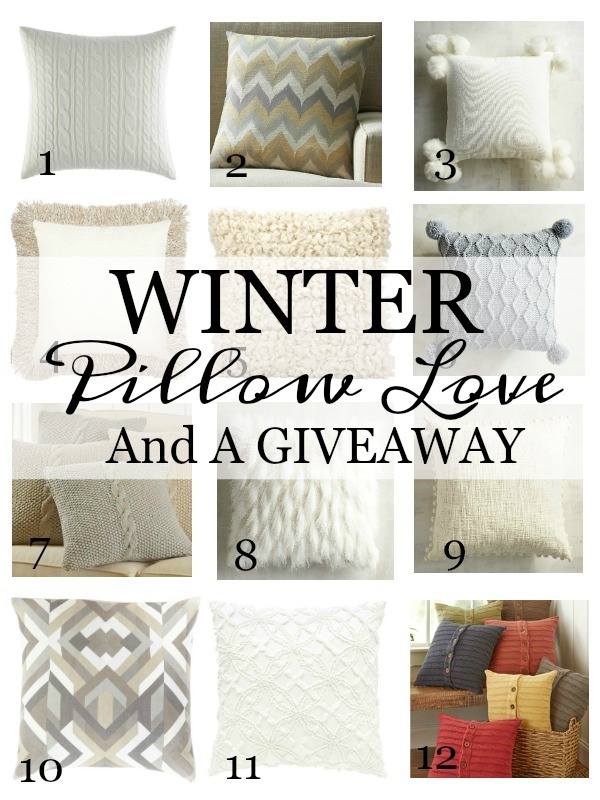 Let’s find some winter pillow love! Winter is all about whites, and neutrals and warm cozy looks. But the main element I think of is TEXTURE! Nubby, soft, furry, knits, geometric patterns, embroidery… any fabric that we can “feel” with our eyes. 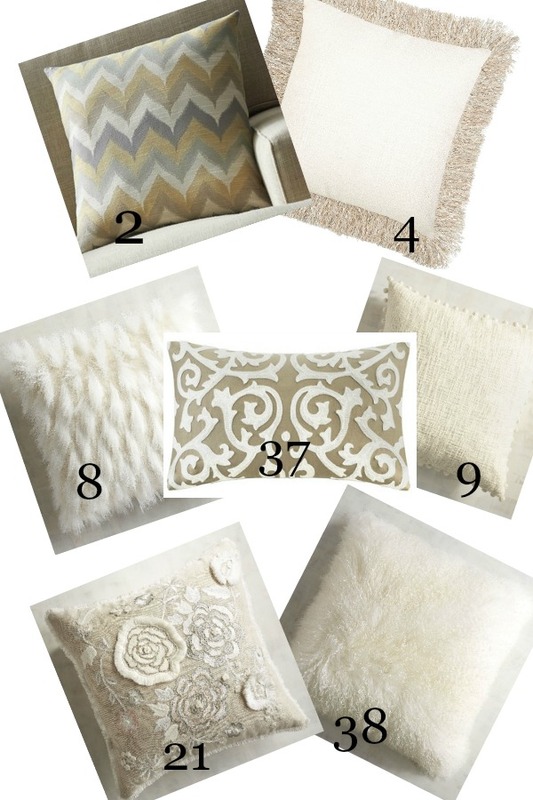 This winter pillow love collection is replete with TEXTURE! And here’s an extra bonus… these pillows are very very reasonable and many are on sale! 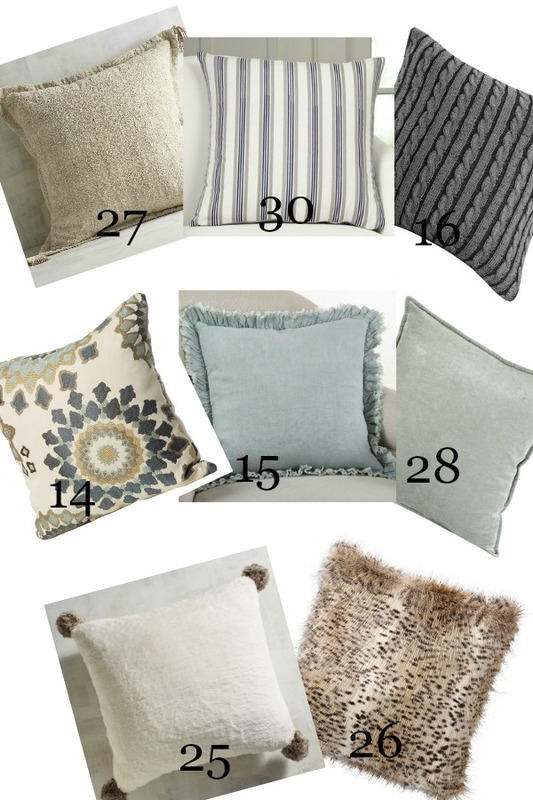 To see more or order a pillow in the collection find the number at the bottom of each section that corresponds to the pillow and click on the name. If you like a pillow you should click on it. These little thumbnail images don’t do many of the pillows justice. I just ordered pillows 2, 3 ( (I am over-the-moon about this sassy pillow), 6 and 23 (love the cheetah!) I have pillows 4, 5 and 20. Pillow love is really a fabulous addiction! 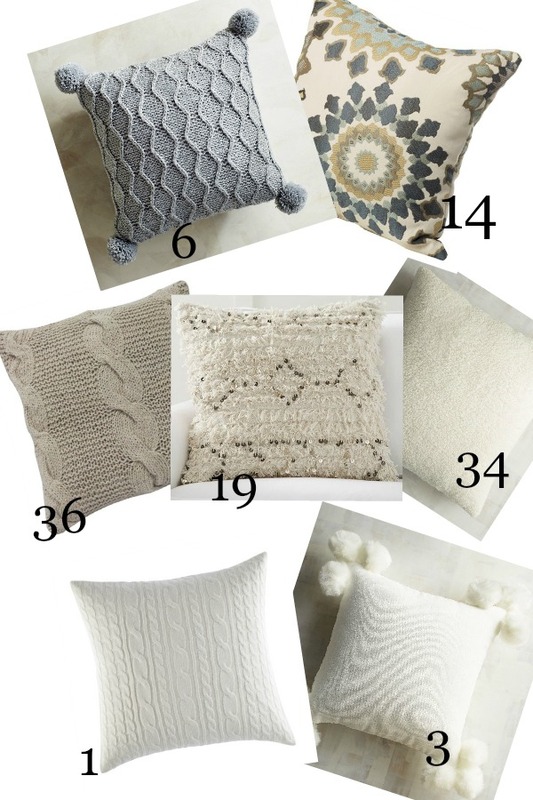 Here are my favorites in a Winter Pillow Love collection! A pillow is nice on its own, but even better when they appear on a sofa or twin chairs as a pair! Also, make sure you layer pillows! Here are a couple examples of pillows I love together! I would love you to share your favorite picks here and I’d really love to hear what combinations you would put together! You are such a talented bunch. Now let’s give a pillow away! One of these beautiful winter pillows could be yours! I’m giving away one pretty pillow to a lucky StoneGable winner! Just something fun for you! Did you know I have a Pinterest Board called “PILLOW LOVE”? I bet you will find pillows you love there! You can find my PILLOW LOVE board and follow me on Pinterest HERE. Subscribe by e-mail to receive daily inspiration. I like the cozy texture of pillow 13 & 17. Love your combinations. We are moving to a new home soon and you gave me great ideas !! I think sweater pillows are just the thing for this cold cold winter! Yes, I am loving sweater pillows! Enjoying your blog! I am clueless when it come to decorating so you have been truly a BLESSING to me. I am loving pillows 3 & 6. Can you please tell me where you got the black and grey and white bird pillows? Thanks!!! Love the pillows! 3, 8 and 25 are my picks. Stay warm! It’s COLD here in Oklahoma. Have been enjoying your holiday posts! Sending prayers your way for a speedy recovery and a wonderful New Year. I am a pillow lover also and love the pillows on your family room sofa…the wicker looking ones. Where would i find those or some similar? I love your style,its so comfortable. The best of 2017 to you and your family. Have been enjoying your holiday posts! Sending prayers your way for a speedy recovery and a wonderful New Year. I am a pillow lover also and love the pillows on your family room sofa..the wicker looking ones. Where would I find those or some similar. I love your style ,its so comfortable. The best of 2017 to you and your family. 4, 15 & 31, so hard to choose just one. Thanks for offering the giveaway! Love Love Love the neutral cozy warm feel. Thank you for sharing. Love the simplicity and even tone of #1! It would go in any of my rooms! LOVE pillows and covers….these are beautiful. My favorite is #6, hands down. My combo would be #22,7,and 1. They would look wonderful on my white sofa. So many would look go with my couch…one of my favorites is number 5. Loved seeing all the pillows! I am sewing new cushions and couch covers in soft beiges and medium blues. 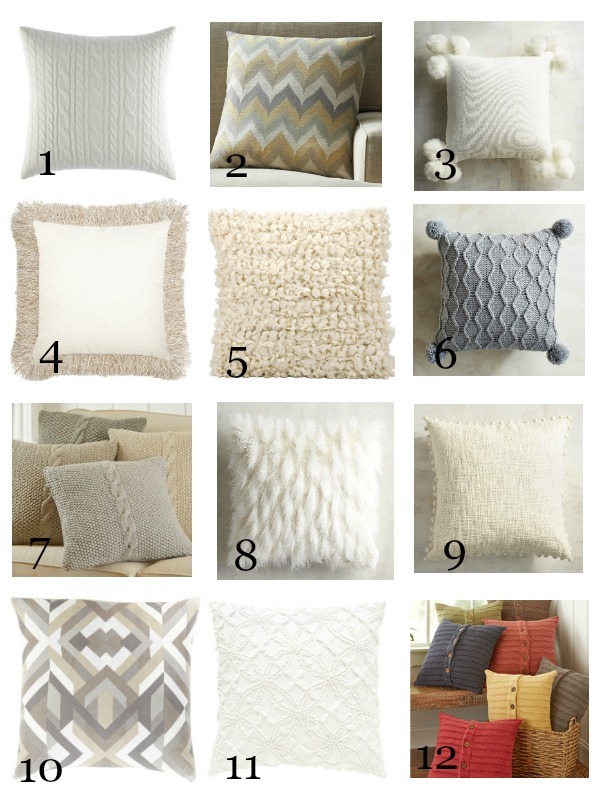 I love all the pillows… January is a time for winter whites and blues and new starts! I love numbers 1, 8, 13, and 33. Great selection of pillows! I’d love to see you to do something similar for blankets 🙂 God bless! The Lohr Wool Pillow is beautiful! My choices would be pillows #12,#15 and #31. I especially like pillow#23 but they are all so very pretty. If I should have the luck to win, I would be so pleased if you would pick a good combination. If I buy another pillow…….. My husband ….. Well…. Lol! But if I win one—– score!!! Lol! My issue is where to store them all. Thank you for all the inspiration. 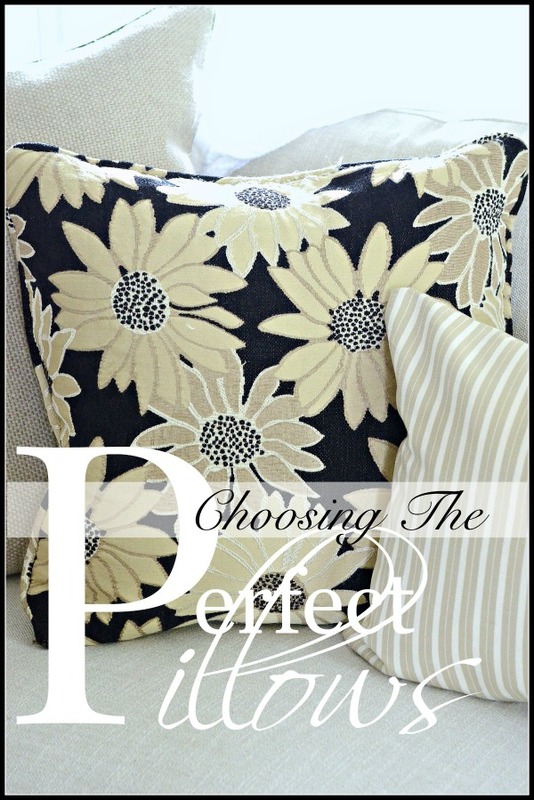 You always seem to put together the prettiest pillow combos! This is my very first post on this site and i just have to let everyone know how much I truly I enjoy it! The pictures are just lovely! Hi Dona! Welcome to the StoneGable family! All the textures are a feast for the eyes! Great pillows! 15,8,21. So pretty, all of them! Love them.Have you ever tried making one from an old sweater? No but I would like to! I love a lot of your pillows. Where do you get most of them? Thank you! Love the winter pillow selection! Mad about leopard! Love #8 and 25 they are beautiful! Enough said. I love 8,9,18,21 and 38 especially. But they are all nice and so many would add pizazz to many rooms. Fabulous collection. Thank you – these are fantastic!! Thanks for all that hard (fun) work of finding perfect winter pillows! This is off the subject, but I would like some info about boxwood wreaths. Is a preserved one the best to get? And where is a good place to get one? I know nothing about them, but really like how they look. Hi Sandy, A preserved boxwood wreath will last for years if cared for. A regular boxwood wreath will last one season. I love preserved boxwood wreaths and collect a couple every year. They can be a little pricey but when it comes to preserved boxwood wreaths you get what you pay for. Here are a couple sites I have gotten my preserved boxwood wreaths from: http://rstyle.me/~9dRRi…http://rstyle.me/~9pEpR…http://rstyle.me/~9pEqb. Hope this helps. they add the finishing touch to a room. Love any pillow that resembles a sweater! Love so many of them…but especially 9 and 27. Why it’s a PILLOW PALOOZA! One was more beautiful than the last! What a generous giveaway! If I won I would let my daughter pick her favorite for her first apartment that she is slowly trying to decorate! My personal pick for her dark gray sofa would be #26 & #38, but what do I know? I’m only her mother! Happy New Pillow(s) and Happy New Year to you! Here’s to a comfy, home sweet home in 2017! I absolutely adore your site!!! I have saved every email you have sent and read and re-read them <3 Keep up the good work!!!! Bless your wonderful sweet heart, Janie! Happy New Year! #3 and #21 .. pick me! Pick me! I love how pillows freshen up a room …. I’d be happy with any of your fun options! I am all about pillows. It drives my husband crazy! I love #4 and I think a cute pillow collection would be 4,35,36 and I’m following you on Instagram! :) Happy New Year! Oh Yea!!! See you on Instagram Stacy! Yes, they are all lovely but #1 is so cozy. It was very hard to pick just one pillow for the entry to your giveaway. So, so many gorgeous pillows! Thanks for all the pillow love. 1,15 and 31 would be perfect in my bedroom! My fav is the Lovely Floral pillow. My favorite pillows for the winter are the ones that look like sweaters. They just seem fitting for the season. I love pillow too and is hard to choose one but my favorite is # 32 and the favorite combination would be #8#37#9. Thank you! Just love #2. It would look perfect with the navy herringbone pillows I just made for my daughter! I LOVE these pillows! But I’d be interested to know how you store all your “out-of-season” pillows. I live in a 100-year-old Craftsman cottage, which means NO CLOSETS! I couldn’t agree with you more! I am pillow obsessed… especially for the holiday. So many colors, patterns and whimsy to choose from. Some of my holiday pillows will stay around for the rest of the winter. They’re very neutral and go with everything. Love all of them, but 21 and 37 are my favorites!! 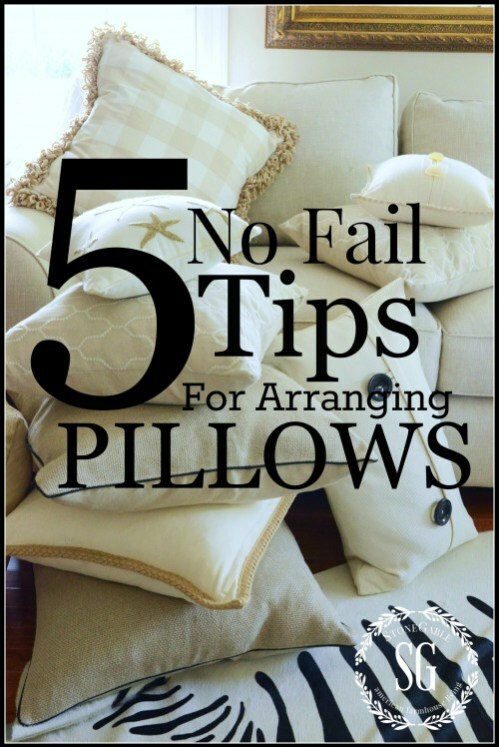 love all the pillow…#4 is my favorite…love how you talk us through decorating…love it! Pillows – what a difference they make. Pier 1 has the best pillows ever! You rock the pillow posts! But I love all of them…mostly the fur, appliques and ikat!!!!! omg…. 6, 27 and 14. Would look awesome on my new sofa. They are all beautiful! Because I love all the pillows !!!!! I’m think I’m a fanatic to pillows too !!!! 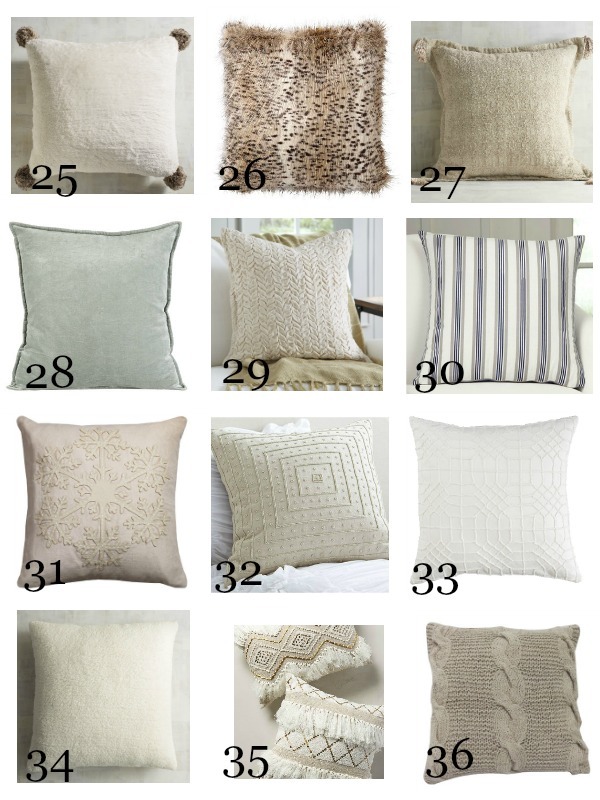 Would love to see #37 the Moroccan lumbar pillow with a couple of #29 the velvet quilted. My fav is #17. Love it! Two of those on my bed would be perfect. I also like #21. And the leopard one…and the Pom Pom one…and..and… Lol I love pillows, too, but don’t have near the collection that you have, Yvonne. I’m in love with pillows 1,3 & 13 even though I like all of them these are the most special to me and will go with my decor. I could definitely use a new pillow for the winter to make my house feel more cozy ! Any of these would be wonderful choices for my home; you did a fabulous job of putting a collection together. My husband got my one of the white Ikea Ektorp sofa’s for Christmas and I can’t wait to pick up some pillows for it. I just wish more merchants would consider covers. We don’t always need the full pillow or have the space for all those pillows. Goodness you could store a bunch of covers in the same amount of space that one pillow occupies. 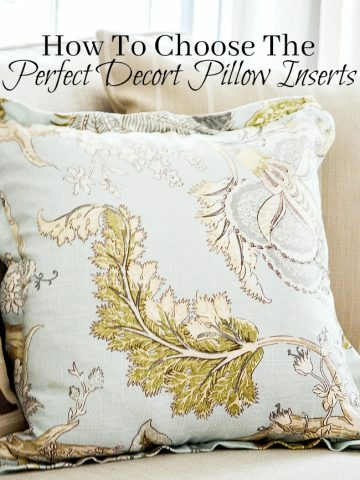 I have a pillow addiction too so I LOVED this post! Thank you so much! My favorite pillow is number 11, but number 1 is a close second. I guess today I am drawn to all white and textured pillows. Maybe its the snow we have in NE PA. I like the 4. Confetti fringe ivory pillow. Frankly, I’m embarrassed top tell; you just how many of these pillows I already have! It is so nice to find someone else of like mind who loves them as much as I do. Thanks for a great post, Yvonne, dare I say I’ll be pillow shopping again today. 🙂 Happy New Year! 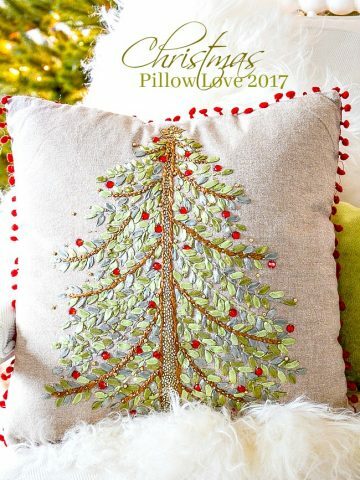 Great post Yvonne I love pillows no matter what time of the year it is I love to decorate and change them around the house. I also sew many pillows especially from old fabrics which I buy when ever I find them. Have a Happy new year. Hope you are recovering well from the surgery? Too hard to pick just one. All are so lovely. Oh, man… I missed putting my other two pillows in the collection field. I really like #6, 30 and 33. Would love them in my blue/white bedroom! #6 looks like it is already out of stock at Pier 1 . Sad day. Thanks for the post, though! Yvonne, I enjoyed your post as I love pillows and use them whenever I can. However, I am on a limited budget and usually purchase my pillows only from Kohl’s or Target.. not that there’s anything wrong with them as they have lovely pillows! However, I was hoping I would have an opportunity to win a finer pillow and was eager to enter your give away… until I found I had to follow you on Instagram. I don’t appreciate how you, as well as other bloggers, ask that a reader follow them in order to enter a contest. I don’t follow ANY social media… and have no desire to! This leaves me out in the cold. I know I am in the minority. I am very disappointed I don’t have a chance to enter your contest. Still, I love your blog and have written comments on several occasions. You have shown us a great selection of pillows here… just lovely!! Have a great New Year 2017…Speedy and Healthy recovery…. and a Blessed new year of many milestones to enjoy with your grandson!!!! Denise… I really appreciate your comment and your desire to not engage in social media as your choice. As a blog reader, and a Stonegable fan, I’ll just put in my thoughts here, real quick, in order to maybe give another viewpoint. Sooo many pretty pillows it would be difficult to narrow down. 1, 3, 7 and 11. I did all the colors earlier in my life. ALL the colors, even red walls. Neutrals/white is my happy place and has been good for 6-7 years…..so staying there. those are all wonderful pillows, tho. thanks for sharing them. It’s soooo hard to choose!! I love so many of them! I never thought of pillows as a way to change up the same old room. Thank you so much for this amazing decorating tip. HaPpY NeW YeaR to you and yours !! Pillows: 16 / 22 / 30. Sooooooooo many options !! F.U.N. so nice in the evening with the fireplace on and all other lights off… and soft music from the Sonos. take care… stay warm… Linda of No.Cal. I love 12 and 20. Happy New year!!! Did you take your tree down? I just can’t do it yet. Maybe next weekend and that way we can celebrate Old Christmas. The tree is still up because I am in a cast from a foot fracture and an operation. I have a friend coming next week to take it down. So we are still really enjoying it! 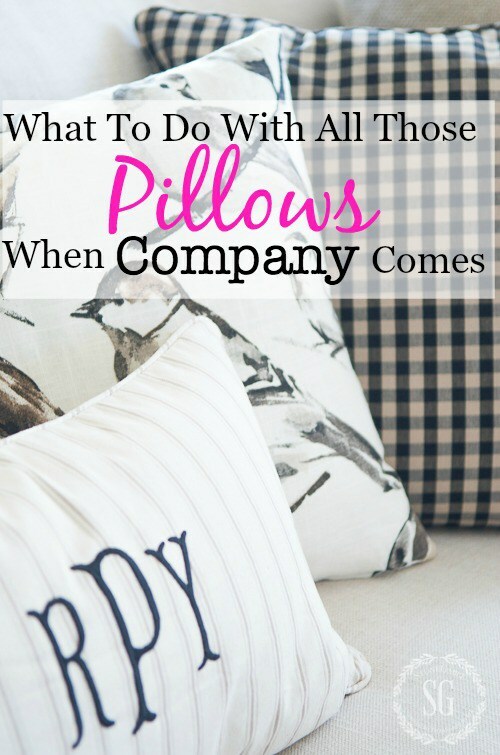 You need to read WHAT TO DO WITH ALL THOSE PILLOWS WHEN COMPANY COMES… it’s near the end of the post. Happy New Year Yvonne! You are a an inspiration. Love your work and faith! My personal favorites are 8, 19 and 30. Alas! I am back to my first rule of decorating: time to clean the house! Bless you! Thanks for sharing such a great selection of pillows. I love the all! Happy New Year! 1-14 are lovely. What a great giveaway. Thank you? #19 is my favorite! I love the simplicity of the pillow, but it has an elegance to it also. Probably 4 and 9. Love them all! You chose lots of gorgeous pillows but my absolute favourite is 11 the Candlewick Cotton Throw Pillow in Mineral. The texture on this pillow is amazing! I would put together 6,10 & 16. Love all of these pillows! Too hard to decide, but that cheetah print with the red piping! What more can I say! I know! I think it’s so much fun! 1, 4, 27, 32 make the top of my list! And ever since I started following you, I am obsessed with pillows and how much they can change the look of my spaces! Love 1, 33 and 37. I don’t have a sweater pillow. They look so comfy and cozy. I am also addicted to pillows!! Just can’t have enough!! I had a really hard time just choosing a couple, but my favorites are: 15, 17, 21,25 ,35! I love, love, love #5, 17 and 21! And like you, Yvonne I love pillows. My storage is limited (for seasonal pillows and other things), so I have been trying to find and use pillow covers instead. I wish more companies would make top quality pillow covers. You give us so many ideas and faith messages! I’m wishing you only blessings in the coming New Year! Thank you Linda, Blessings to you to for a joyful New Year! The Lohr Wool Pillow is beautiful! Thanks and Merry Christmas! So many wonderful, fun pillows. Hard to chose a favorite. Love you blog. You are a wonderful inspiration to all of us. I love #2. Happy new year!? 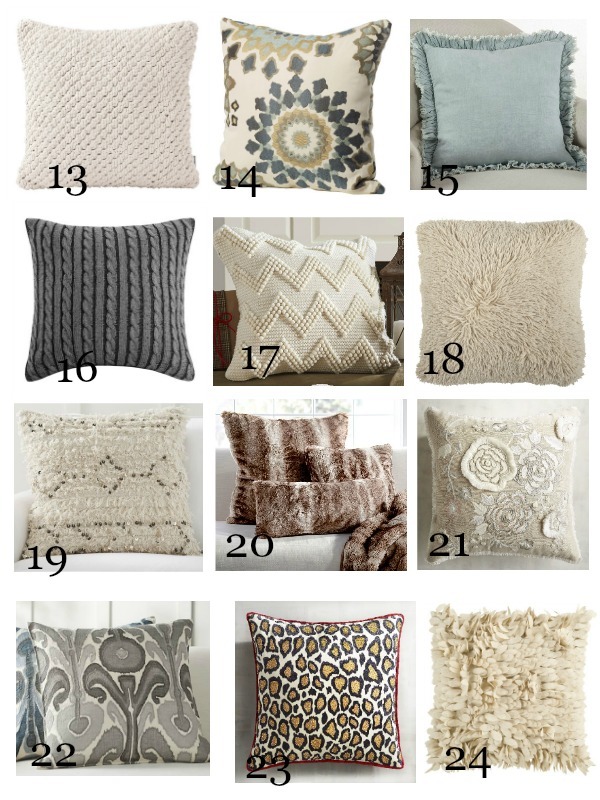 A great selection of pillows – I especially like 11 and 15. Thank you! I picked pillows 2 and 4 before I saw that you had paired them together. I, too, love pillows and like to change them according to the season. Love numbers 3,8, and31!! Thanks for the give away!! Hope you are doing well!! Love them all but #1 and #7 are calling my name! Love this post Yvonne, thanks for doing all this work for us that makes shopping SO much easier. Happy New Year!! Hi Nancy! The pillow love posts are so much fun for me too! Happy New Year. Love all the ” sweater” pillows! They really say ” cozy”! I too love pillows but with a limited storage I am drowning. Please help. I ordered some of the covers that look hand painted that you had but cannot remember the site. Can you help? They have the red truck with tree in back that I want to order. Thanks. Happy Nee Yesr and God bless you and keep you. lovely pillows, just saw a lovely one with a map of the world that I like also. What a great post. I like the cozy sweater look for the cold winter nights . The Pom poms seem to be a hit and they give a little texture. I don’t know which pillow to order to complement my sofa and chairs. Thanks for the great opportunity to win a pillow. I love changing the pillows on my sofa and on the bench on my front porch. It’s hard to decide, but I like 1, 14 and 31. They are all beautiful and would add to any decor. Pillows are the perfect touch to a room. I like to purchase a new pillow for spring and winter to freshen things up. I bought holiday pillows this year and they transformed my living room! I never met a pillow I didn’t love!!!!! I love #6 and #2 for my winter look!!! Too many beautiful pillows! I would choose #14, #6, & #38. Beautiful collection of pillows. Love the variety of textures! I retrieved pillows from my tag sale box to boost up my Grandson at the table. I found out that under that pink fleece (from my daughters dorm room many years ago) were down pillows. Can’t wait for some time to make new covers. I’m going to try a bulky knit pillow. I’m so excited! Thanks for inspiring me. Oh, I’d love to see them Mary. I love 3,8,21,31 are my favorites! Love 1,4 and 7-I’m tempted to try the ones with big pom poms …but am afraid my little havanese will mistake them for a little toy for her ! I love Ella Cable Knit No. 1. and No. 11. Cable knit perfect for the winter. I will be in need of some new pillows to dress up my new ivory leather furniture. Our landlord is purchasing for us…love 17 I think the most. Love when you post your pillows!! Thanks for the giveaway! Love the faux fur pillows! Even though I’m a nautical girl, those faux furs are calling my name! Happy New Year!! # 1 and 15 – comfortable blue jeans and a cozy sweater this time of the year. Thanks to you I just now buy the pillow cover since I purchased the pillow previously!! Love that idea!!! Pillows are to a room like accessories on an outfit!!! 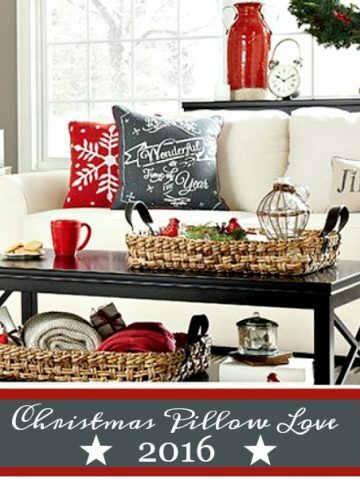 I had some really awesome Christmas pillows that I had purchased from Pottery Barn and Home Goods but now that the holidays are over I need a couple of new ones and the ones you have shown are so nice! Thank you!! I think I am in serious trouble with my pillow addiction. So many pretty ones here, but my favorites are the Christmas ones! Love the pillows with the buttons! Great selection to dream about! Wow! #30 and #16 would enhance my den! The knitted ones make me want to find a pattern…..someday! The textures are so interesting. I also have a pillow addiction. A girl can never have too many pillows!! Really liking # 4, 5, and 26, but any of these neutrals would work nice with my colorful collection. ? I love them all,but 1 and 9 are calling! Just this last year have I started changing out my couch pillows. We bought a new tan couch, and it really needs pops of color. Thank you for the beautiful choices. I keep thinking I should add a pop of color to my home too but I just love my neutrals! My favorite pillow from the collection is the Elliot throw pillow. My collection is #5, the Elliott; #30, the Toby; and #33, the Romantic Glam. It’s hard to choose one as my favorite. I do like 15 a lot and love the look of 12 with different color options. I haven’t been a furry or fuzzy pillow girl, but and I considering it since we always need to be open to new things. You taught me how to style pillows some time ago, now I’m hooked! My favorites are 17-12-31-7-8. That is how I would arrange them so the snowflake was right in the center! Great post! I love all the pillows. What fun picking out my favorite combination! So many pretty ones to choose. They all are gorgeous but my favs are 19, 27 and 35. I love your taste in ‘everything ! Your home is such an inspiration to me. Happy New Year !!! ooooh I love me some pillow love!! My faves: 9, 11, 21 and 31. I’m planning to pick up at least two of these to add to my growing pillow love collection! I have 17 — it’s a great winter pillow with lots of texture and best of all, it plays well with others! What a fun opportunity! I love pillows, finally got around to purchasing some new ones recently but I’d love to add a few more! Love 17, 21 and 32. I can see all of these in my home. Happy new year. Welcome to my blog and my life! I’m an empty nester living with my wonderful husband Bobby at StoneGable. Our home often feels like a hotel, filled with family and friends. I love all things HOME AND GARDEN! Living by grace, I strive to live large and love all those who cross my path. My front door is always open to friends… old & new!